Our first stop on our world trip and one that we planned to be relaxing. 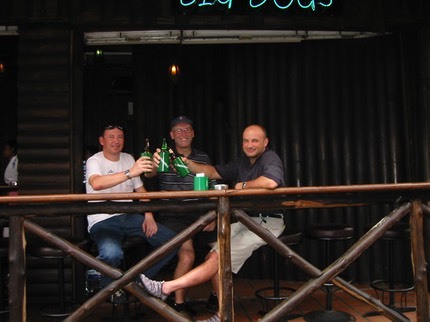 Bangkok got us started before we went to Koh Chang, a southern island to chill. Once back in Bangkok we also visited Ayuthaya, the ancient capital and Kanchanaburi, gateway for the Bridge over the River Kwai. We really like Bangkok as it had plenty to see in the shape of temples and also great night life. 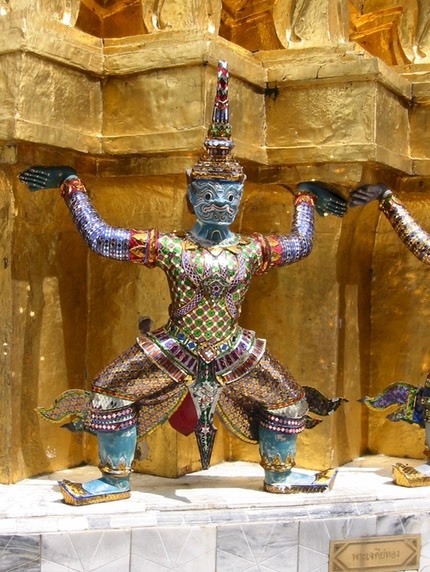 The main temples in Bangkok are incredibly ornate and offer almost too much to take in. We ate well and cheaply here and spent a lot of time on the river zooming up and down on fast express boats. Getting around is easy and we did the obligatory Tuk-tuk trip. We stayed in an area called Sukhumvit which boasts some cool hotels (Suk11) and the Nana entertainments plaza, a 3 storey entertainment paradise. From Kanchanaburi we took a trip to the death railway which was a very interesting experience seeing what the POWs achieved in very trying conditions. It was quite funny to see how many Japanese tourists were also at the site, clicking away with their Fuji cameras. We took a detour on the way back to visit the Tiger Temple where Buddhist monks have 7 rescued tigers which they walk around on leads and let tourists pat them. Not to be recommended but you can't say no can you. Notice the bond villain like character on hand to rescue you. 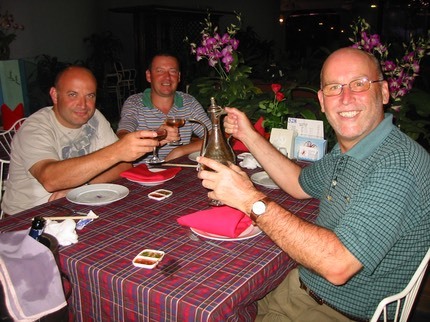 I returned to Bangkok and Hua Hin in May 2006 for a golf tour. 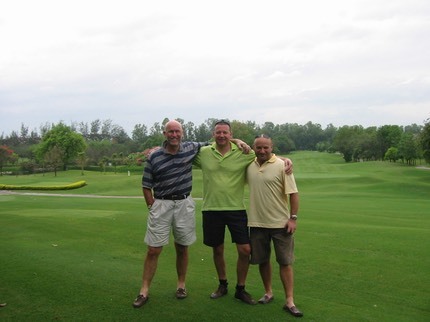 Absolute cracker of a trip playing 2 rounds near Bangkok and 3 around Hua Hin. Nightlife fantastic, especially around Nana although many of the bars on Sukhumvit have gone since I was last there. A mate and I did a fantastic shark dive in a aquarium in a shopping centre. Awesome. 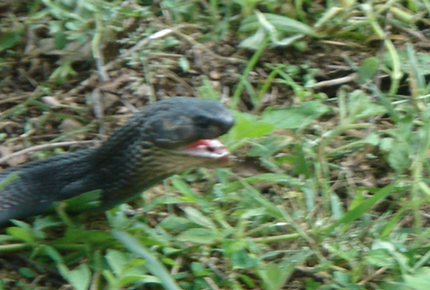 On one round of golf near Hua Hin, there was a close call with a large vicious snake which had just caught a frog and was disturbed by one of our balls. It spat out the frog and moved menacingly towards us. Quick photo and quick exit. A bar in Nana Plaza - great place to people watch. The fish restaurant and the mightly Aladdin's lamp trophy. Back again for New Year 2009/10 and as a transit for the rest of our tour. 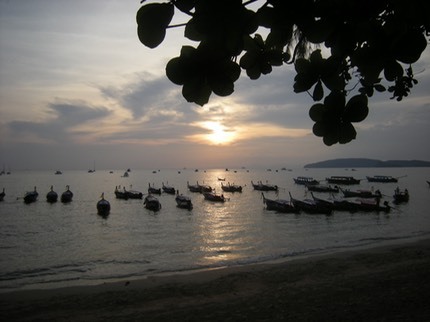 Spent New Year in Krabi which is no where near as good as many people would have you believe. Our hotel, though, did put on a massive show for New Year's Eve with dancers from all over Thailand and a tasty buffet. It ended with a huge firework display on the beach with everyone, including me, setting off fire lanterns.